I bought my “Bocking 14” Russian comfrey several years ago from Ragmans Lane Farm in Gloucestershire, England. Scarlet posted a comment yesterday to tell me that they’ve stopped selling it … shame. 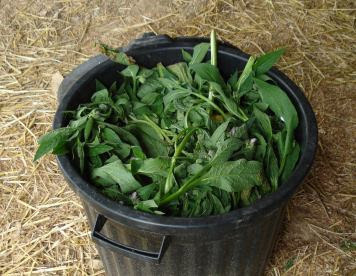 It’s important that you are sure that the comfrey you are getting is this variety, especially if someone is kindly giving you some, as Bocking 14 won’t spread all around your garden, unlike wild comfrey. 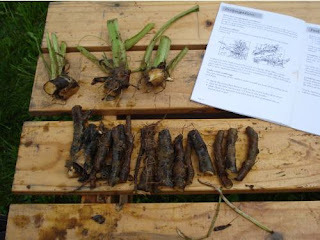 I digress … I bought root cuttings about 5 cm (2 inches) long which I buried in the garden in the net bag I had them in (to preserve them) then dug them up a couple of months later to take to France. They got moved twice more and we currently very healthy bed of comfrey plants. Whilst Bocking 14 might not spread, it’s almost impossible to lift a plant completely: invariably you’ll leave a segment of root behind, which will regenerate. So, you need to choose where you want your permanent comfrey bed. 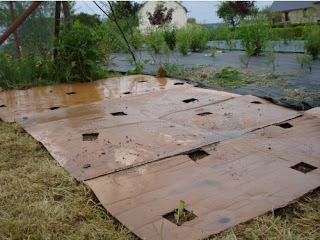 Simply plant your root cuttings just below the surface, water them in and wait (you can mulch them with cardboard, as we've done here, see photo). One extra tip, use some anti-slug and snail strategies until the plants get up and going, as these gastropods really like comfrey (another of its uses to place cut leaves around plants as a slug barrier, as the slugs will go for the comfrey, in preference). Digression upon digression, sorry! My preferred method of propagating comfrey once you have established plants (at least a year old) is to lift the whole plant and divide it into offsets and cuttings (see photo: offsets at the top, cuttings below) and then plant these as you did with your original cuttings, and don’t forget to put one bit back in the hole where you lifted the original plant from. Making comfrey tea – liquid concentrate. I think that the video explains this, this photo shows the plastic dustbin full of leaves which reduces to the goo in the video, don't add water. Dilute to use, 20 water to 1 comfrey juice (by volume) when it’s thick and black or 10:1 if it’s thinner and brown in colour. For further ways of propagating comfrey, making comfrey tea and other ways of using comfrey, buy the cheap booklet Comfrey for Gardeners. Really like your site! Interesting and beautifully prepared. 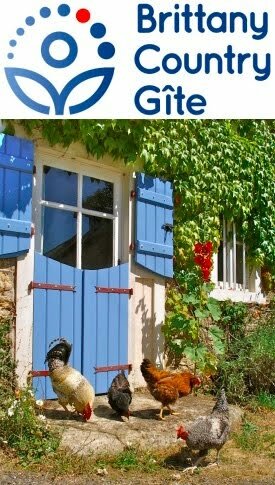 Especially interested to read your feature on comfrey — I wonder whether you've come across my son-in-law's operation, they call it B-actif, also Brittany based, in which they use comfrey (B14, like you) as the basis of a range of garden products? It looks to me as if you'd have a lot in common. They're on www.b-actif.com, but I'll tell him about you anyway. Good luck with your attractive-sounding project. I've had a look at your son-in-law's site, it's very impressive. I'll be getting in touch with them. Hi Stuart and Gabrielle ! Is you comfrey up yet ? Mine is in leaf and I have a friend who'd like some root cuttings this year. Let me know if you're willing to send him some - if it's not too late ! If not I'll contact my Scottish pals.